Our road trip was going smoothly. 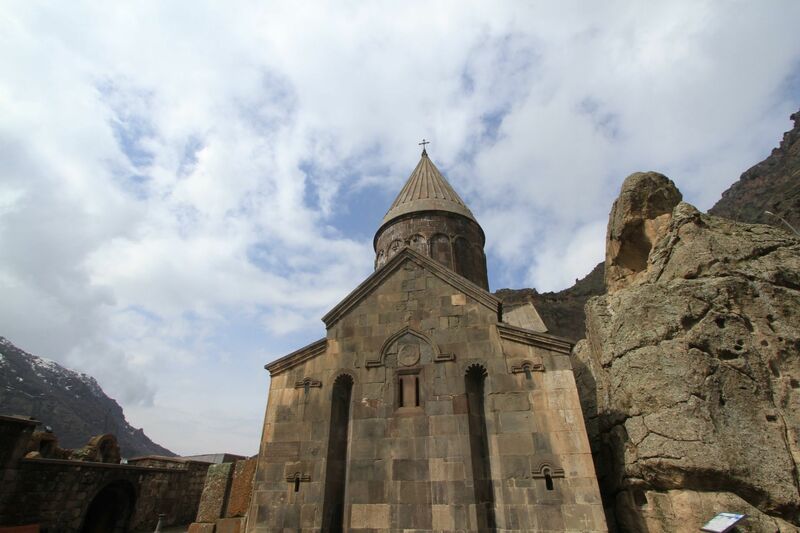 We had enjoyed Yerevan, and now we were on our way to some big sights, the Geghard Monastery and Garni Temple. Both exceeded our expectations, and the fact that the pastel blossoms of spring popped, we were definitely in our element. What do you think of our Armenian experiences so far? Are you putting it on your list yet? Unfortunately we just didn’t have a lot of time on this trip, and we wanted to head back towards Tbilisi, but we were hoping to see a few things along the way. 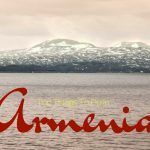 We considered making reservations for a place in Lake Sevan, because everyone had told us it is so beautiful, but we talked ourselves out of it. According to one website I read there is an Armenian saying that goes something like, “Have you taken your guests to Geghard? To Garni? To Sevan? If so, then you have done your job well, and they have seen it all.” I kind of wish I hadn’t read this, because I followed it too closely. I figured if that is what the Armenians thought was important, then that is definitely what we should do, and that is exactly what we did. The two places we were headed first was the Geghard Monastery and the Temple of Garni, and luckily they are down the same road. On the way we tried to decide which to do first–the furthest or the closest. 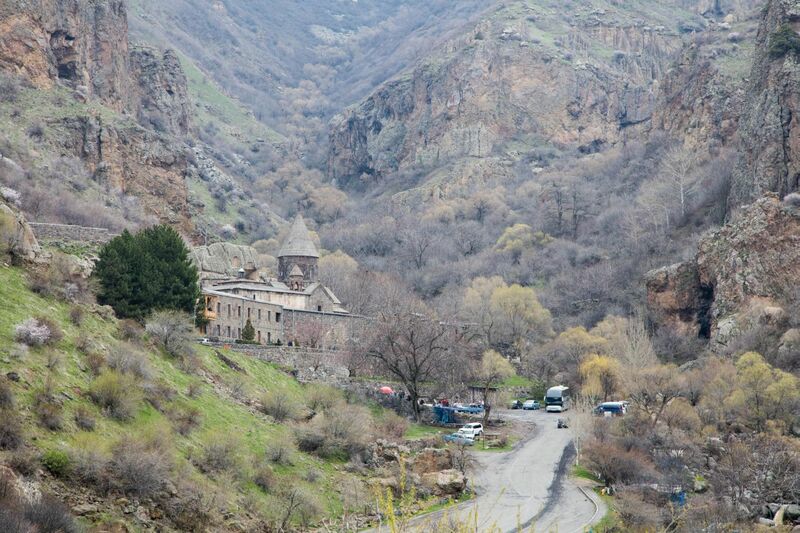 We chose the furthest, and Geghard was as far as you can drive. 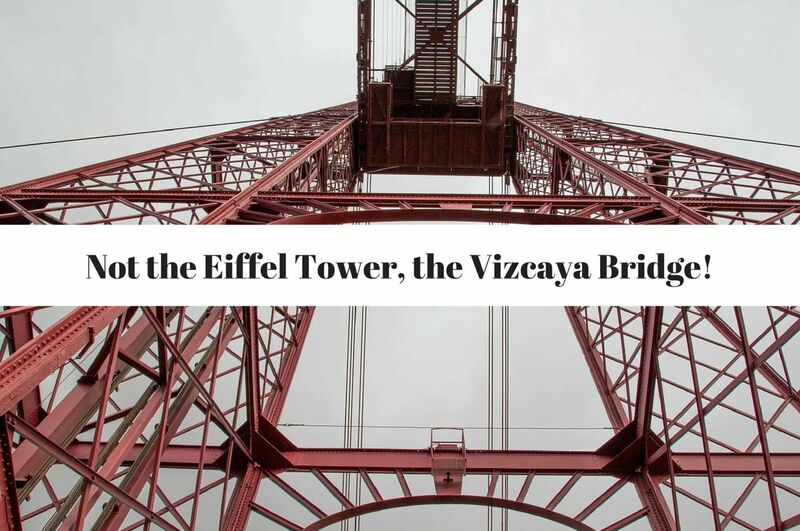 It’s situated right at the end of the road, and the whole complex overlooks the opening of the Azat Valley. In early spring and with a light mist falling, it looks like a pastel colored pencil drawing. 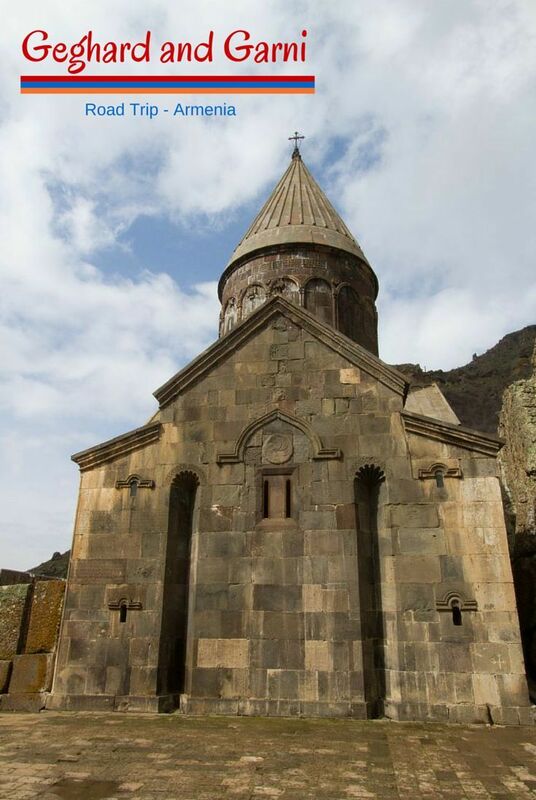 The monastery of Geghard began to emerge right out of the living rock in the 4th century soon after Armenia declared Christianity its religion. Caves were cut out of the rock, but as its importance grew, so did the need for larger spaces and the current cathedral was begun in 1215. As you enter the grounds, it is natural to first go directly to the cathedral which is decorated with intricate carvings on the outside and blue frescoes on the inside. However, the best part for me was climbing around outside. There were steps up to a second level that held a few caves cut roughly into the stone. 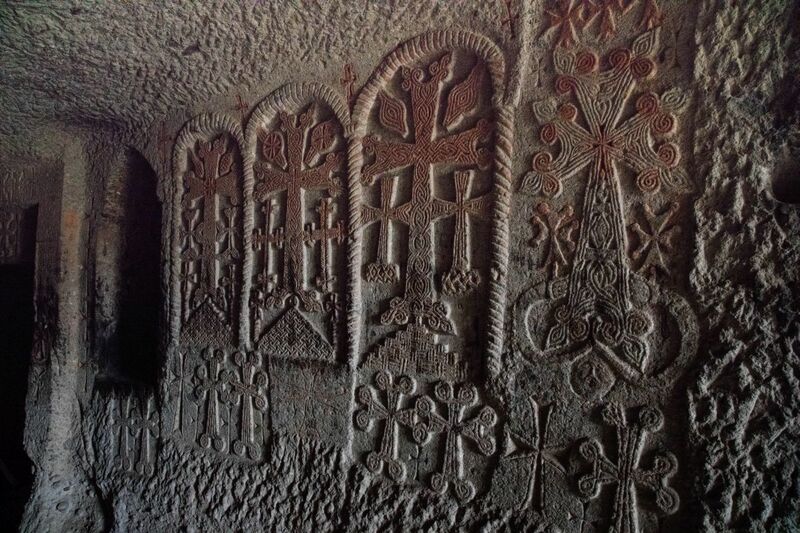 On the walls of the main corridor were some khachkars, Armenian crosses, carved along the length, each one uniquely designed. The light was dim, but there was one candle burning which lent a beautiful glow to the rock and accentuated the chiseling in the cross’ design. 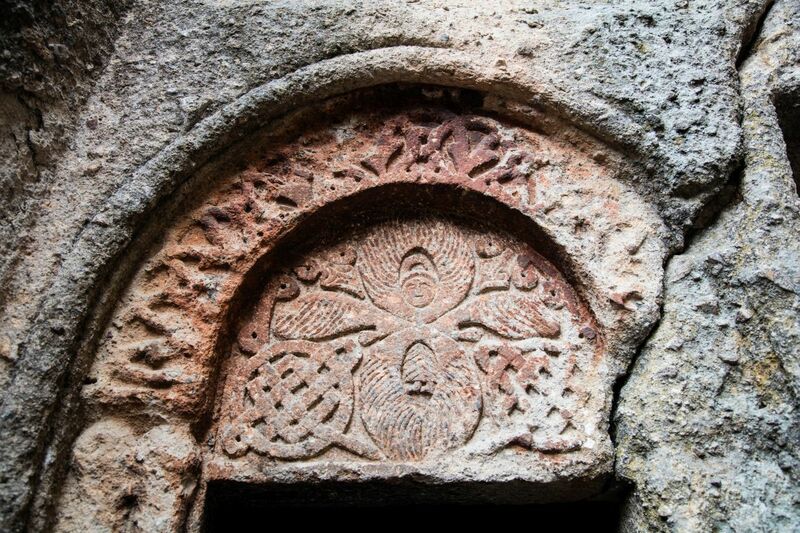 We took our time at the entrance, talking with the friendly staff and admiring the stone carvings and paintings. Then we walked into the courtyard and marveled at the massive rock church. There were flowering trees and shrubs in the green spaces between the cliff face and the monastery grounds and colorful bee hive boxes placed in the garden. We were immediately sidetracked and went up to visit the gardens, but we noticed the one small tour group was clustered together listening to their guide on one side of the courtyard. When we saw a small group of ornately robed women walk across the courtyard we wondered about it but went right back to inspecting the gardens and bee boxes. There were plenty of backward glances as they shuffled, reluctantly out of the church. It was clear that many of them wanted to stay and find the source of that amazing music. We, on the other hand, decided that finding that choir had to be our new priority. We had seen them go up the stairs and disappear through a small cave entrance so that’s where we went. 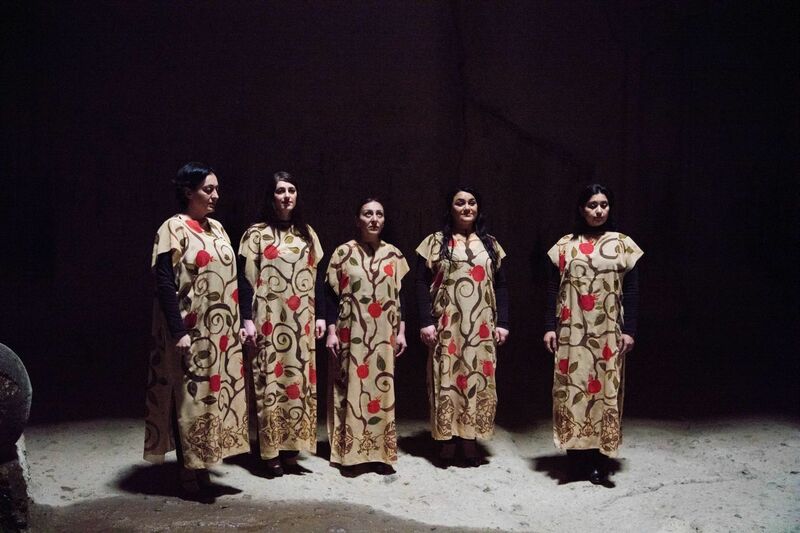 Sure enough, this small choir group had made their way into a rock-hewn chamber in the heart of the church and was performing an impromptu concert. It was absolutely beautiful. Words can’t really do it justice, so here is the video I put together for your enjoyment. Reluctantly, we climbed down and exited the gate walking down the hill to the parking lot and through the gauntlet of village ladies plying their handmade wares. I had nodded to a couple before we headed up, so I knew they would be waiting for me. You probably know that I’m not a shopper, but I had seen a few food items I’d wanted to try and now was my chance. The ladies were so fun and happy knowing they were making a sale. From the first lady, I bought some dried fruit sheets called lavashak. We bought pomegranate, sour cherry, and apricot. Apricot was our favorite. I also had to buy some sujukh, which really means sausage because it looks like one even though it is a sweet wine must made into a paste and spread over the string of walnuts. Moving on to the next vendor, I had to buy some gata, or cake. I had read about this delectable cake before our trip and felt really lucky to have found it being sold by a local instead of in a shop. Not only was it supposed to be a tasty treat, but the decoration on top was stunning as well. Wisely the vendor gave us each a taste. The yellow sponge was split in the middle and stuffed with a honey and butter jelly. It was delicious. The problem was these gatas are huge! She let us buy only a quarter of one, and we couldn’t even finish that much. Do you know how you leave a site and you just have that feeling of warmth and goodness? We thoroughly enjoyed wandering through the various caves and chapels at Geghard, but we were slightly on a time crunch and ready to move onto the Temple of Garni. 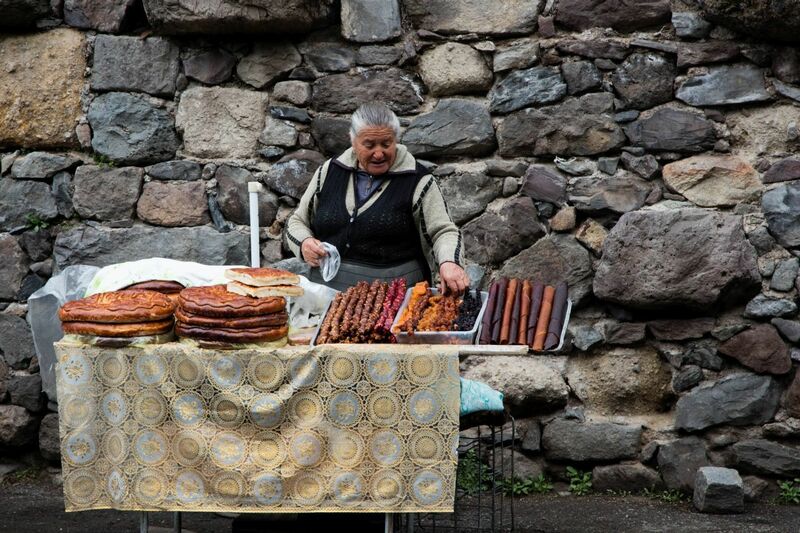 Now, remember Garni is always mentioned with Geghard as something every visitor should see. Unfortunately, I’m not sure I agree. 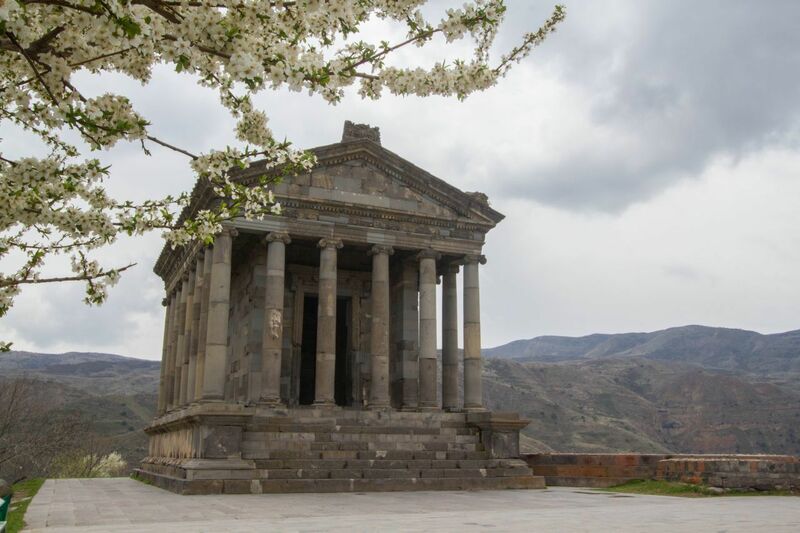 The Temple of Garni is a reconstructed Greco-Roman colonnaded temple. It sits majestically on an outcropping of sheer cliff high atop the valley floor below. If not for the dark color of the stones, I could have sworn I was in Greece! The temple grounds are small and well taken care of with an apple orchard and a flower and vegetable garden and, of course, the requisite bee hives. I was glad we had gone on past to visit Geghard first as Garni was already a little crowded and most of these tourists would be heading there next. As it was, we were able to wait a little and then we had the temple to ourselves for a little while until the next tour bus pulled in. We stayed for a time really just enjoying the spring air, because the sun had come out and it was a peaceful spot even with the many tourists that made it that far down the road. However, we were trying to get to Lake Sevan, the third place that Armenians are so proud of that they want all their visitors to go to, so we didn’t dally. It is an easy drive, with only a few rough areas, however, our small rental car had no problems with it. The monastery can be visited every day between 8:00 A.M. and 8:00 P.M. Accommodations are few and far between once you leave Yerevan, it is far better to find a hotel there and take a day trip out to Geghard. Find more information and check opening times before you go, at the official website. We thoroughly enjoyed our morning in the Azat Valley and as we drove up the road, we munched on more of our sweet treats. 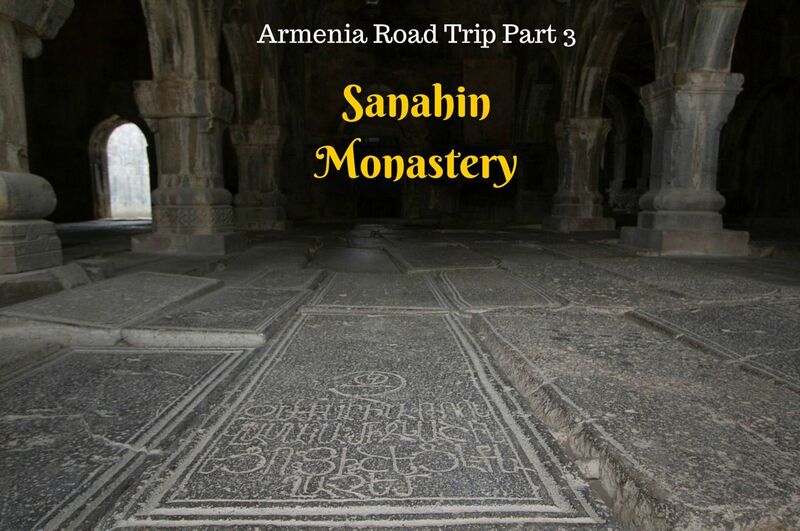 We were hoping to get to Lake Sevan and find lunch, then hit up the Sanahin Monastery. 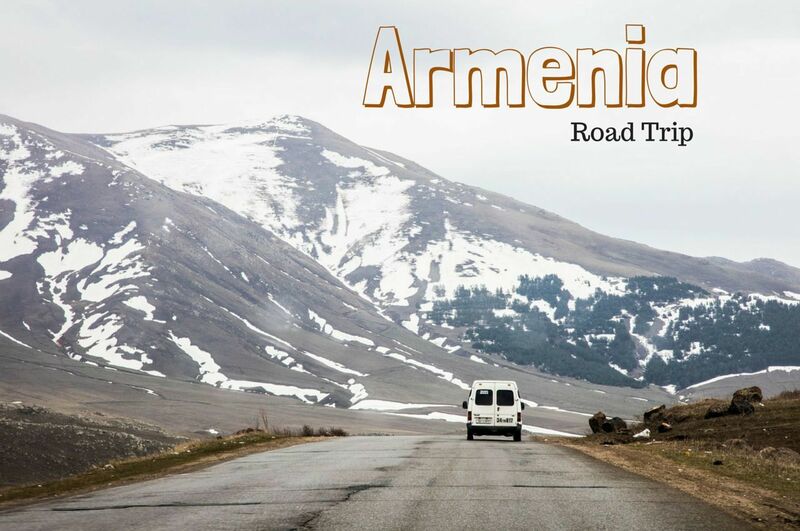 There is really quite a bit to do and see in this small country, plenty of reasons Why to Travel to Armenia. Loved Geghard and Garni, and the valley with Mount Ararat in the distance. Interesting to think, after the apocalyptic flood (according to various myths, but still…) – the only survivors stepped off the boat/arc, wandered down the Azat Valley and began humanity all over. Sophie, It’s certainly a beautiful area, isn’t it? Are you going to TBEX in Stockholm this summer? I’d love to meet you! Sophie, Well, keep me informed. I also want to go to Tajikistan, so I can see your dilemma! 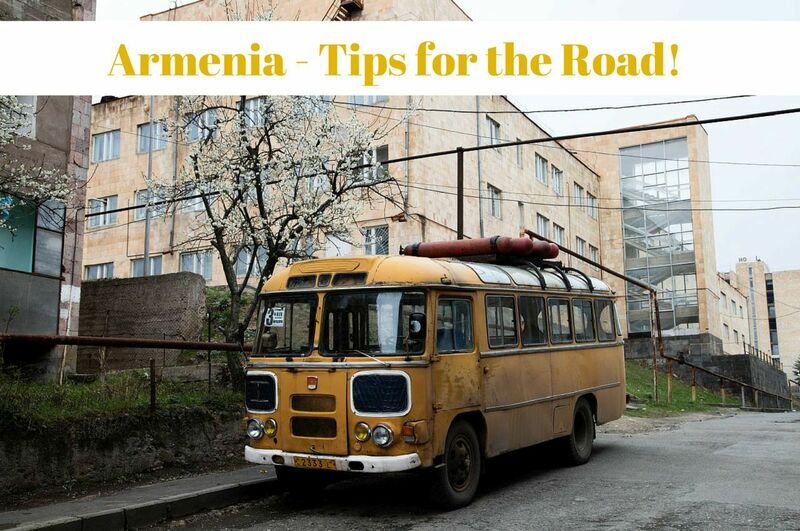 Loving the photos, I will have to consider Armenia as my next travel destination! Sally, We really loved it. In fact, our stay was too short, so we need to go back, too. Definitely on our list! Thanks for sharing your experiences. Heather, I hope you get there. We are already talking about our next trip there. Churches, temples and a place not many people have written about and you’ve got me hooked. Love virtually experiencing Armenia with you. I learned quite a bit about the food already. There’s a big Armenian population and community in Los Angeles. One of our favorite chicken places with the best garlic sauce is Armenian. I’ve always been curious about it so I’m glad I got a great glimpse of it. It’s beautiful and interesting. 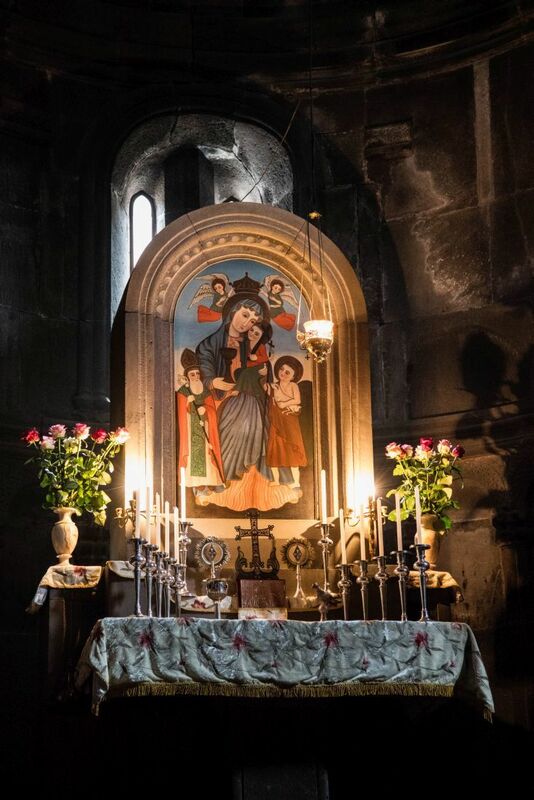 Mary, We really loved our few days in Armenia, but decided it wasn’t enough. We should have spent a week. We loved it. Corinne, I loved reading about Armenia and can’t wait to read Part 3. I do so want to visit; it’s on my bucket list. Thank you for sharing your trip! Karen Lynn, It’s a fascinating destination. You can read Part 3 and 4 already. They’re published! Thanks!